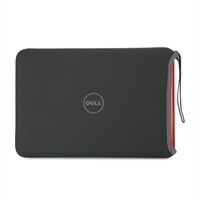 Dell Sleeve (S) - Fits Inspiron 11” (Fog Gray)Carry and protect your laptop with the Dell Sleeve (S) - Fits Inspiron 11”, which features a sleek, vividly colorful design you can take anywhere. Made for mobility, the versatile sleeve is specially designed for the Inspiron 11” 3000 series systems (Models 3162/3163/3168/3169). The sleeve is also reversible, giving you the option of your preferred tone of gray. Carry it alone with the small carrying handle or slip it into another carrying case for easy mobility. The sleeve provides extra protection when storing your Inspiron 11” inside of a larger bag. Carry and protect your laptop with the Dell Sleeve (S) - Fits Inspiron 11”, which features a sleek, vividly colorful design you can take anywhere. Made for mobility, the versatile sleeve is specially designed for the Inspiron 11” 3000 series systems (Models 3162/3163/3168/3169). The sleeve is also reversible, giving you the option of your preferred tone of gray. Carry it alone with the small carrying handle or slip it into another carrying case for easy mobility. The sleeve provides extra protection when storing your Inspiron 11” inside of a larger bag.